Tomorrow - Thursday, October 6 - is absolutely the last day that we can accept late entries for the 8th annual Stevie Awards for Women in Business, the world's premier honors for women entrepreneurs, executives and the organizations they run. You'll find the entry kit here, online. It explains how to choose categories and prepare entries. When you've written your entries, submit them here. Late entries will not be penalized in any way in the judging process. Preliminary judging to determine Finalists closes on Sunday, and Finalists will be notified next Wednesday. This year's Stevie Award winners will be announced at a dinner in New York on Friday, November 11. Attendance is not required to win. Who do you know who should be nominated in the Stevies for Women? We're expecting more than 300 women entrepreneurs and executives, and their guests, to attend tomorrow night's Stevie Awards for Women in Business in New York. They're coming from all of the U.S.A. plus Australia, Austria, Canada, Germany, Israel Japan, Malaysia, Sri Lanka and Turkey. A PDF of the awards dinner program is now available on the awards web site. Look for photos to be available starting Saturday, and video clips of the presentations sometime next week. 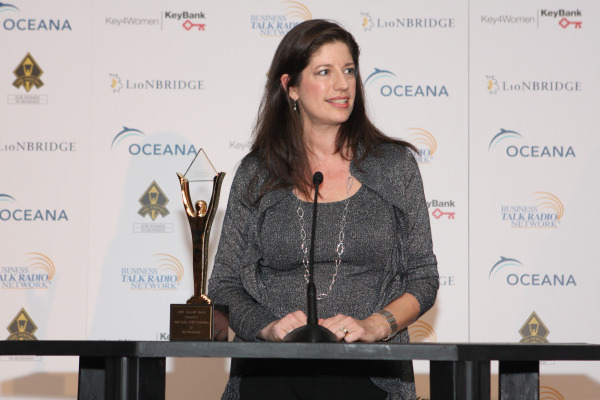 Today we announced the Finalists in the 2010 (7th annual) Stevie Awards for Women in Business. Personally this is my favorite Stevie Awards competition, because the stories of success that women entrepreneurs and executives tell are often so dramatic, and women give much better acceptance speeches than men do. Find the full list on the Stevies for Women web site. We had a record number of entries to the Stevies for Women this year - more than 1,200. 13% better than last year. The majority of entries to this competition are still from organizations in the U.S.A. - I'd like to see this competition become more broadly international, and we're working on that - but we received entries from Australia, Austria, Bulgaria, Canada, France, Germany, Japan, Israel, Malaysia, Mexico, Sri Lanka, Turkey, and the United Kingdom as well. This year's awards dinner is back at the Marriott Marquis Hotel in New York City, and tickets are now on sale. Last year the event had more than 330 women and their guests from the U.S. and several other countries, and I expect this year's attendance to be just as strong. Sara Eisen of Bloomberg TV will emcee. Among the leading contenders with multiple Finalists are BGT Partners, Miami, FL; The Buildmore Group Pty Ltd, Caloundra, QLD Australia; Elite Editing, New York, NY; Euro RSCG Worldwide PR, New York, NY; JCPR, Parsippany, NJ; Kryon Systems, Tel Aviv, Israel; MWW Group, East Rutherford, NJ; ODEL Limited, Rajagiriya, Sri Lanka; Reserveage Organics, Gainesville, FL; and VerticalResponse, San Francisco, CA.